Dawson Snidow, right, at Splitting Timber, 6401 W. Marana Center Blvd., learns the sport of ax-throwing with his father, Lee. Brett Joyce, and wife Megan Joyce aim to bring hatchet throwing activities to Tucson at St. Hubert’s Hatchet House, located at 908 W. Prince Road on Feb. 1, 2019. Fleur de Tucson is among several companies in the area that offer hot-air balloon rides. Say “I love you” on Valentine’s Day with a mariachi band. Taking in the petroglyphs at Signal Hill in Saguaro National Monument West is a way to get outdoors for a special experience. The last tower holds the fifth and sixth lines at Arizona Zipline Adventures south of Oracle, Ariz. Two people can zipline down the 1,500 foot long drop together. There are five runs in an interconnected course on a 20-acre parcel of private ranch land in the Catalinas. This 1949 Airstream at the Shady Dell B&B in Bisbee is one of nine vintage trailers available for guests to rent. Some folks say Virginia is for lovers. We say it’s Southern Arizona. When it comes to romantic things to do, there are an abundance of them in this area. Whether it’s sunset at Gates Pass or listening to a rushing stream on a sunny afternoon at Sabino Canyon, you can’t help but feel all mushy and, well, romantic when you are with that special person. You know all the standard gift ideas. With Valentine’s Day on the horizon, we’ve come up with some you may not have thought of. Here are a few chock-full-of-thoughtfulness suggestions that say “I love you” with a Southern Arizona accent. Take flight: A rising sun, champagne brunch and a hot air balloon flying over the Tucson Mountains and Saguaro National Park West. What’s not romantic about that? This one is for early risers: Becky Fleury, owner of Fleur de Tucson Balloon Tours says hot-air balloon rides in the evenings are not allowed here. The 60- to 90-minute ride isn’t cheap — it’s $250 per person at Fleur de Tucson — but it will be memorable. And in the sky over Tucson in a hot air balloon might be just the place to pop that question. No, not “Why didn’t you tell me you were afraid of heights?” You know the question we mean. Several companies offer rides. Google “hot air balloon rides Tucson” for a list. A prickly present: Flowers are a traditional Valentine’s gift. Give it a twist with a cactus with a stunning flower. Mark Sitter, owner of the massive B&B Cactus Farm, suggests a pincushion. They’re in bloom now, and depending on the species you’ll get pink, white or red flowers. They start at about $3.50 at B&B. Most any store specializing in cactus should have them. A serenade: How romantic would it be for your love to wake to the gorgeous sounds of a mariachi band singing a love ballad outside her or his window? It can be done — most mariachi groups in town are game. The serenade was traditionally done at the stroke of midnight, says George Bejarano with Mariachi Alegre de Tucson, but these days the neighbors might complain, and that’s a tad late for many musicians. And Bejarano and others say a half hour is wisest for a serenade. “Two love songs and she’s got the message,” says Bejarano. Among the groups offering the serenade are Mariachi Alegre, 981-3459), which charges $275 for the five musicians; El Mariachi Tapatio, $300 for the 10-member ensemble, 603-1819); Mariachi Herradura de Tucson’s Valentine’s Day serenade is $200 for the five-piece ensemble, 867-1370). Picture perfect: You can check out over 200 prehistoric Native American petroglyphs at Signal Hill in Saguaro National Park West. This is an easy walk to an amazing wonder. Pack a breakfast or lunch and eat at the picnic area at the trailhead, then stroll on over to the hill. The bulk of the centuries-old petroglyphs can be seen from the trail. Like the love you have for your valentine, these are precious and historic — heed the signs warning you not to leave the trail or touch the works. Take Ina Road west of Interstate 10 to Wade Road and follow it south to Picture Rocks Road, take Picture Rocks west to Sandario Road. Turn south on Sandario Road, pass Rudasill and Manville roads, and watch for a left turnoff for Golden Gate Road. Follow Golden Gate Road to a left turnoff for the Signal Hill Picnic area and petroglyph site. Find more information here. Starry starry skies: Head to the University of Arizona’s Flandrau Science Center and Planetarium and take a free peek through the 16-inch telescope. You can see Saturn’s rings through that baby, as well as Jupiter’s cloud belts and the Andromeda galaxy. This is run by volunteers, who usually are standing by to give the cosmic glimpses from 7-10 p.m. Thursday-Saturday. Best to call ahead and make sure it’s happening. After checking out the stars, check out the "Laser Queen" show at Flandrau (9 p.m. Fridays and 8 p.m. Saturdays). The show matches laser lights on the dome to Queen’s music. And we like this part: You can sing along. If you want to see just the show, it’s $8; if you long to explore Flandrau, it’s $16, and that includes the show. Zip it: Arizona Zipline Adventures has a special setup for Valentine’s Day: A sunset zip. You can zip across all five of the ziplines, which are 400 to 1,500 feet long. You get the thrill of the ride and the thrill of the desert below you. After, cuddle up and sit around the fire and indulge in the s’mores bar. It’s 4:30 and 5:30 p.m. Valentine’s Day, and the cost is $85. Not as romantic but just as fun, we suspect: You can mix your ziplining with a little target shooting at Old Tucson. The shooting is with a laser gun. Old Tucson has set up a 350-foot line, dangling 25-feet in the air, and placed seven targets for you to test your skill with the laser. It’s $20 a ride, $45 for three, and $100 for 10. Add to that the $19.95 Old Tucson entrance fee. And there are a few caveats: Riders must be between 40 and 250 pounds and no taller than 6-feet, 5-inches. Old Tucson is at 201 S. Kinney Road. Ax me if I love you: OK, this might not scream romance or I love you, but if you want to test the trust in your relationship, we dare you to find any bigger test than playing with hatchets. Actually, there’s a lot of skill involved, we’re told, and there’s barely a slim risk of getting hurt; the facilities in Tucson include a training session before you begin. Read more about it here. The activity has made its way to Tucson in the last six months or so, and boy has it sprouted: Two ax-throwing arenas — St. Hubert’s Hatchet House, 908 W. Prince Road; and Splitting Timber Axe Range, 6401 W. Marana Center Blvd. at Tucson Premium Outlets — opened within weeks in late October and early November. Several other venues including AxeHouse, 1102 W. Grant Road in the SlaughterHouse, offer ax-throwing as a sidebar to other events including escape rooms. St. Hubert’s is open on Valentine’s Day from noon to 11 p.m., 349-8434; Splitting Timber is open 10 a.m. to 10 p.m., 820-1126. Both recommend reservations. Take a trip: How does a romantic getaway to artsy Bisbee sound? Here’s one way to make that very special: Stay at The Shady Dell Vintage Trailer Park. Rates are $85-$125, depending on which of the accommodations you choose. Among the choices: a shiny 1955 Airstream, an Airfloat, which was quite the travel trailer in 1957, and a 1955 Kropf trailer, decked out in vintage ’50s decor. But owner Justin Luria says the most romantic and most popular isn’t a trailer at all: It’s a 1947 Chris Craft yacht. It’s landlocked, but once you down the complimentary champagne, it shouldn’t be too hard to imagine you’re cruising across the ocean. A concert: Roseanne Cash is headed to the Fox Theatre Feb. 20, so make your Valentine’s Day gift a couple of tickets to go see the Grammy-winning crooner. She’s been doing plenty of tunes from her 2009 album "The List" on this tour — when Cash was 18, her father, Johnny, gave her a list of 100 must-learn songs; she pulled from that for the knockout album. All the loveseats at the Fox are sold out for this concert, but that’s OK — you can sit next to each other and hold hands while you get lost in Cash’s voice. Tickets are $29-$49. 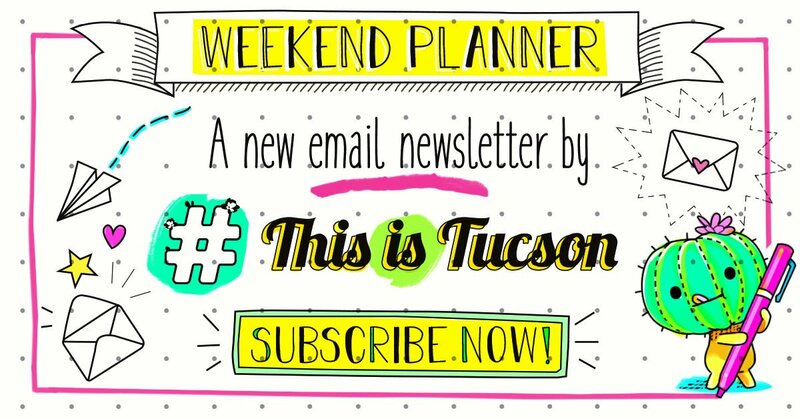 Contact reporter Kathleen Allen at kallen@tucson.com or 573-4128. On Twitter: @kallenStar. Cathalena E. Burch contributed to this story.